Dessert is not served at Chinese meals in the same way as in Western countries. Generally there is no separate part of a meal that is reserved for eating sweet dishes. Banquets typically end with a plate of assorted fruits. 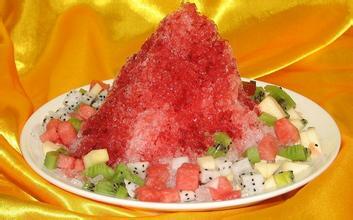 However, China is home to many dessert-like foods, either as part of a meal or as a snack. 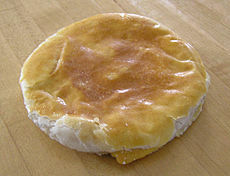 Bing refers to a large and varied group of baked wheat flour based pastries. They are either similar to the short-pastry crust of western cuisine or flaky like puff pastry, the latter of which is often known as su. The preferred fat used for bing is lard. One of the more commonly known are the moon cake (yuebing), and wife cake (laopobing (second picture); sometimes translated as sweetheart cake), pastry with a thin crust of flaky pastry, and a filling of winter melon, almond paste, and sesame, spiced with five spice powder. 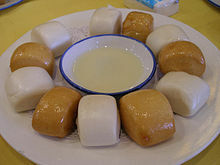 An interesting combination of Chinese and Western ingredients is the deep fried mantou, served with sweetened condensed milk (first picture). Chinese candies and sweets, called tang, Chinese for ‘sugar’, are usually made with cane sugar, malt sugar, and honey. These sweets often consists of nuts or fruits that are mixed into syrup. 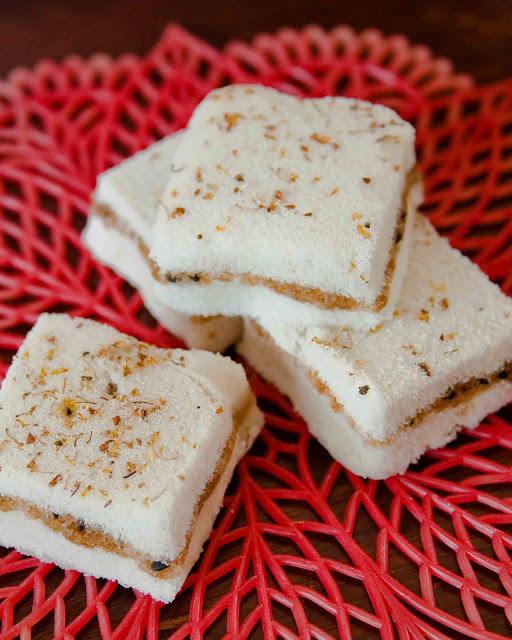 Dragon’s beard candy (longxutang) is a traditional example (first picture), and White Rabbit Milk Candy a modern variety. 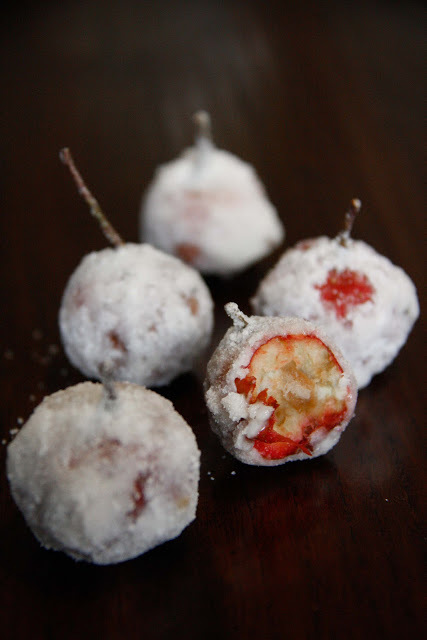 Sugar coating of various fruits can also be regarded as part of this category of Chinese sweets or desserts. The traditional favourite fruit here is the hawthorn. Hawthorns are a member of the rose family and the red berries are the size of a large, round, rosehip. Eaten raw they are incredibly sour and quite astringent, but rolled in oil then confectioner’s sugar and left to dry gives the crunchy, sour hawthorns a crisp sweet white crust (bingtang shanzha; second picture). 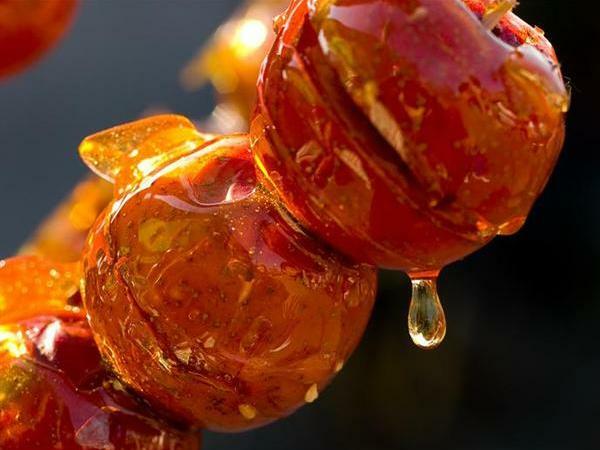 In northern China, street vendors sell glazed hawthorns (tanghulu, literally: ‘sugar calabash’; third picture), made by dipping skewered hawthorns in melted sugar. 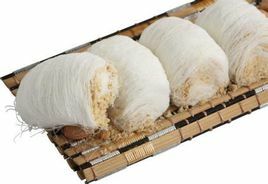 Gao or guo are rice based snacks that are typically steamed and may be made from glutinous or normal rice. These rice based snacks have a wide variety of textures and can be chewy, jelly-like, fluffy or rather firm. Various types of gao include Niangao, a popular type of rice cake, which can be served as a sticky treat or a pudding, flavored with red bean paste or rosewater (first picture), baitanggao, and tangyuan. 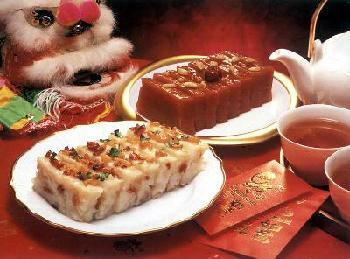 Guihuagao, or sweet osmanthus cake (second picture), is a more delicate variety in this category. Made in a very traditional way, the two layers of steamed white unsweetened ‘cake’ sandwich a sweet red bean paste and black sesame seed filling, with the osmanthus flowers adding a gentle honey scent. Chinese jellies are known as dong. Many jelly desserts are traditionally set with agar and are flavored with fruits, though gelatin based jellies are also common in contemporary desserts. Some Chinese jellies, such as the grass jelly (liangfen) set by themselves. Grass jelly is a jelly that is made by boiling the stalks of a mint-like plant in potassium carbonate and letting it cool to room temperature. It has a slightly bitter taste and is often mixed with soy milk. Jellies sometimes have medicinal properties. 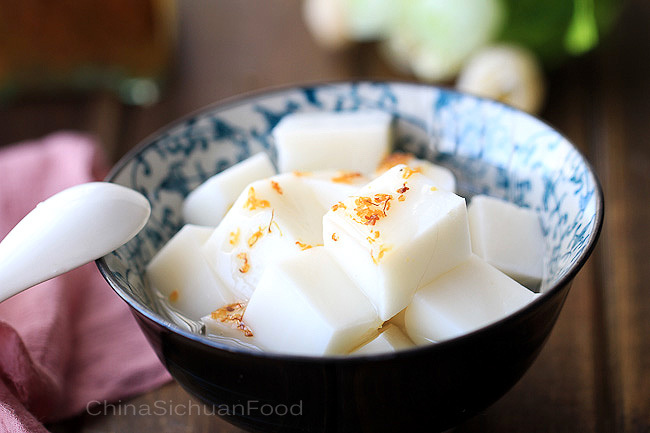 Another famous variety is Almond Beancurd (xingren doufu) Almond tofu is a common and popular Chinese dessert in hot summer. It can be considered as the Chinese version of panna cotta. It is also referred to almond jelly. The recipe differs slightly from places in China, but the common ingredients are all similar: almond, sugar, and agar. 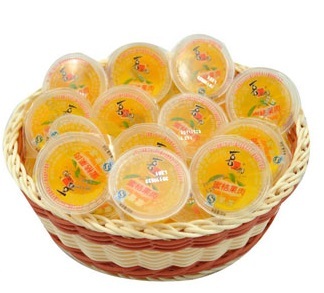 Traditional jelly has become a big money maker as a treat, in the form of fruit jelly (guodong) packed in small plastic cups. The value of this market was RMB 25 billion in 2018. The picture shows tangerine flavoured jelly with the following ingredients. Chinese dessert soups (tang ‘soup’ or hu ‘broth’) typically consist of sweet and usually hot soups and custards. Some of these soups are made with restorative properties in mind, in concordance with traditional Chinese medicine. 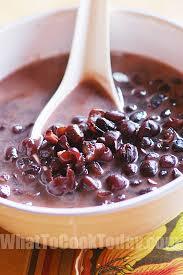 A very common example is red bean soup (hongdoutang). 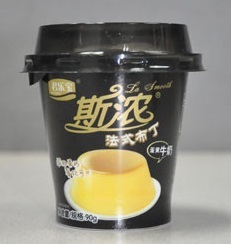 Modern desserts, in particular dairy based desserts like yoghurt or pudding, are widely available in China in a broad range of flavours and textures. See, e.g., my post on ‘old yoghurt‘ earlier in this blog. Babao porridge is sometimes served as a dessert as well.